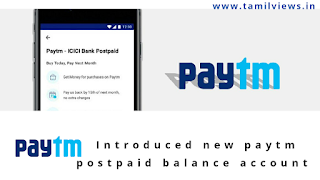 Paytm introduced a new payment method as Paytm postpaid. Paytm is an online bill payment platform that helps you to do an online transaction with zero cost and interest. It is one of the best and assured online transaction platform in India. It crossed above 100 million unique customers in the world. Paytm already introduced new features to her customers like paytm payment bank. That supports all features in the digital world. Now they introduced paytm postpaid payment method. It also likes as Postpaid sim card method. In paytm postpaid, you can spend or buy any products and recharge without any cost but, you can repay the amount in next month 7th day. It also looks like a credit card.Paytm will pay for you any transaction by this method but you can repay the spending amount if you do not repay your spent amount they will be the debit amount in your paytm wallet or payment bank. If you do not repay the spending money in paytm postpaid account your spending limit will be reduced. Paytm serves all user spending limit below 500Rs. Every postpaid bill will be generated in 1st day of next month. Recharges - prepaid, postpaid, DTH, Board brand, landline, Datacard, cable tv. Travel booking - bus, flight, train. Shopping - movies, paytm mall. Scan and pay - petrol, grocery, Restaurants. How to activate paytm postpaid method? After 1 minute you will receive one confirmation SMS to your paytm number then your account will be activated. You can also able to see the paytm postpaid passbook. If you repay the dues in before due day your spend limit will be increased as soon as possible. How does my credit limit get decided? It is Based upon your transaction history on Paytm, they will decide a credit limit to your account. This credit limit increases based on your usage of your Paytm Postpaid. Share it to all your friends by share button below.